Klaassen admits Ajax played poorly. 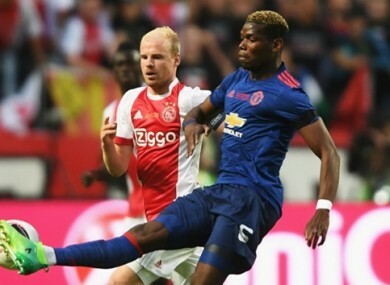 AJAX CAPTAIN DAVY Klaassen accused Manchester United of sitting back and playing a long-ball game in Wednesday’s Europa League final. Jose Mourinho’s side won 2-0 in Stockholm to end the season with a second major trophy and secure a place in the Champions League group stage for next season. United started well and took the lead through a deflected Paul Pogba strike before Henrikh Mkhitaryan hooked in a second shortly after the break following a corner. Ajax enjoyed 69 per cent of the possession but managed only three shots on target as United sat back and comfortably frustrated an attack that proved devastating to the likes of Lyon and Schalke in the knockout stages. Klaassen conceded that his side were far from their best but was deeply frustrated by the approach adopted by their opponents. He told RTL7 : “We were simply not good enough. It is very difficult against a team like that. You know they are just waiting and then kick it long. They scored two lucky goals. “We didn’t start well. We had a bit more possession after 15, 20 minutes or so. They just waited around. Both of their goals were lucky. United are now the fifth team to win the three major continental tournaments in Europe: the Champions League, Europa League and Uefa Super Cup. Ajax, Juventus, Bayern Munich and Chelsea are the others to have achieved the feat. Email “Lucky Man Utd just waited and kicked it long - Ajax captain”. Feedback on “Lucky Man Utd just waited and kicked it long - Ajax captain”.